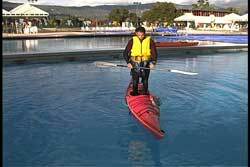 The most frequently used solo recovery after wet exiting is the paddle float recovery. 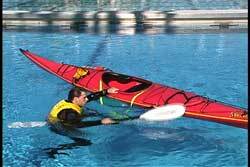 The paddle float converts your paddle to an outrigger which provides you support while re-entering your kayak. See USK article, "Paddle Float Recovery." Even though the paddle float recovery is a reliable one, there are some weaknesses to the technique. If you were to lean away from the float you can capsize. Your chance of capsizing increases when doing a paddle float recovery in rough conditions, because the support provided by the average paddle float is only in one direction. There are some paddle floats that have a pouch attached to it that scoops water. The water in the pouch provides resistance when you lean away from the float. Another alternative for a solo recovery is using a pair of Sea Wings. Sea Wings (also called Sponsons) provide support in both directions when attached properly to the sides of your kayak. By providing more beam (width) to your kayak, the Sea Wings add tremendous stability in two directions instead of just one when comparing it to a paddle float/outrigger. Even though Sea Wings provide stability in both directions it is still possible to capsize the kayak when they are inflated. 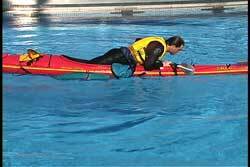 Like any recovery aid you should practice using the Sea Wings so you can learn the parameters of the device. Let's look at the common uses of Sea Wings. Sea Wings are attached to the kayak with quick snap buckles and straps that go underneath your hull. The buckles and Sea Wing straps need to be preset for maximum efficiency. 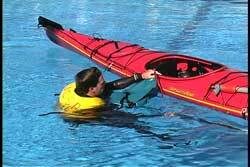 One half of the buckle (female side) needs to remain attached to your kayak if you want to use Sea Wings. You can leave the Sea Wings attached before they need to be inflated, but it will add unnecessary drag when paddling. Newer models of Sea Wings do come with a cover sleeve to reduce drag when not in use. If you don't want the potential drag, you can keep the Sea Wings stored off of the kayak and attach them when needed. Since there are two large bags that need to be inflated your immersion time is longer than the normal paddle float. As always we recommend you dress for immersion. When properly attached and inflated, the Sea Wings make the kayak feel very stable. 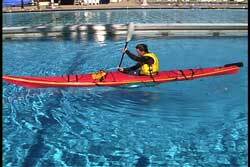 In calm conditions there is enough stability for most paddlers to stand in their kayak and not capsize. I have to admit I don't have the best balance and I have capsized a few times when trying to stand when using Sea Wings, but there were times when I managed to stand up. The standing demonstration is just a way to show the increased stability. I do not recommend that you depend on them for standing in your kayak, especially in rough conditions. After a capsize you need to take your Sea Wings out from where you store them and attach them to the buckles that you already pre-attached to your kayak. There are four buckles and straps that need to be attached and tightened before you inflate the bags. I recommend you perfect your use of the Sea Wings so you can attach them quickly. After watching beginning students practicing with Sea Wings, there were a few instances where I have seen a students get the straps tangled when trying to use them. They eventually untangled them, but I wonder how a panicked swimmer would react in rough conditions if the straps were tangled? That is why practice is so important. It is also important to find your own way of storing the Sea Wings so the straps don't tangle when you deploy the device. As I mentioned before, there are two large bags to inflate so immersion time is a bit longer. As with any inflation device check the integrity of the bags and valves regularly. Unlike many of the paddle floats, Sea Wings do not have a double chamber. If one side fails then you only have stability in one direction. After inflating one side you have to get to the valve to inflate the other side. If you cannot reach over the kayak you can swim around to the other side or go under the kayak. Going under the kayak in cold water can add to your heat loss if your head is uncovered. Heat loss via the head can be significant. Once the bags are inflated you can try your regular re-entry methods to see which ones work best for you. 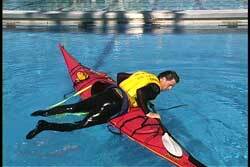 Most paddlers can get into their kayak with the support provided by the Sea Wings and not capsize their kayak. Again, the beauty of the Sea Wings is the support provided in both directions. 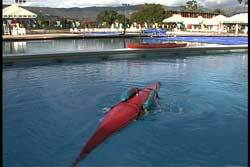 After watching numerous paddlers try Sea Wings, I have seen a small percentage still capsize their kayak when trying to climb onto the boat. Those paddlers had difficulty in climbing on and they needed more support than the Sea Wings provided. 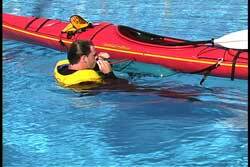 After sitting upright in the kayak you can pump out the water and feel stable while doing it. Due to the stability of the Sea Wings you can also just paddle away with water in the cockpit without taking the time to pump. Of course your kayak will perform better if the water is pumped out. There is no reason to paddle with a cockpit full of water if you have the time to pump it out. I did not find the drag too bad when paddling with the bags inflated. In rough conditions the extra stability may be worth the trade off in speed if you are feeling unstable. There are other options for using Sea Wings. Those that need a stirrup to climb back in may be able to use the Sea Wings without a the standard paddle and paddle float stirrup attachment. See USK article, "Paddle Float Stirrup Recovery." If you use the stirrup around the cockpit coaming you may get enough support from the Sea Wings. I say may, because it depends upon your bodyweight and your technique. In this case the paddler in the photo is very fit and agile. He was able to use the stirrup without the kayak capsizing. This is another case of you trying it out to see if it works for you and your kayak. If the stirrup does not work for you with the Sea Wings, then you may need to use the paddle float and paddle in the traditional way with the stirrup and have the Sea Wings as additional support and for stability when back in your kayak. You will know what works for you when you practice. After you practice the techniques in calm water be sure to practice in controlled rough conditions to see if the support you get will be sufficient from the Sea Wings. Techniques do not always work the same when you and your kayak are being bounced around in reflecting seas. As an instructor and guide I feel one of the greatest uses of Sea Wings is the ability to stabilize a kayak in the event you need to tow a paddler that has difficulty staying upright on their own. If your paddling partner was very sea sick and had difficulty in keeping his or her balance, it would be a lot easier to tow your partner if they had a pair of Sea Wings attached and inflated in the event there were only the two of you. In this picture the paddler is being towed and the drag on the person towing was minimal. Think of the times you wish you had more stability or needed lateral stability in both directions. Sea Wings may be the answer to your quest. I must repeat, even when Sea Wings are adjusted correctly, it is still possible to capsize your kayak. It takes more energy to capsize with Sea Wings in use, but it can happen if you lean too far. After using Sea Wings on a number of occasions I think they are worth having along on tours for the extra options they can provide. 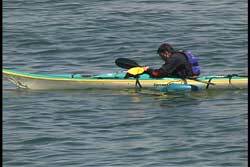 Some adjustments need to be made to fit different kayaks, but it is a small inconvenience for the benefits provided. If you like exploring different options I recommend seriously looking at Sea Wings as part of your recovery/rescue equipment. As our USK motto states "do it in a way that works best for you." Pictures seen above were taken from USK's video "Capsize Recoveries & Rescue Procedures".